Hand on heart, when did you last stop off to explore the Beaujolais region, rather than just barrelling on down the Autoroute du Soleil headed for Provence, Italy or Spain? Come to that, when did you last taste some memorable – even enjoyable – Beaujolais? If the answer to both questions is ‘not for ages’, it’s time for corrective measures. We go back a bit, the Beaujolais and me. In my teens I did the classic French exchange with a wine-growing family in Romanèche-Thorins. They had four sons, a vineyard in Moulin-à-Vent and a privileged view of the eponymous landmark windmill from the house. It was the first region I’d ever visited in France and I fell for it all, hook, line and sinker. Over the years we kept in touch. As newlyweds living on a shoestring in Switzerland (where you need long laces to live well), my husband and I escaped to Beaujolais at weekends, bypassing the austere vineyards of Burgundy (where all we could afford was Aligoté) in favour of the softly rolling, vine-clad hills south of Mâcon. There, we gorged on the cheap and cheerful fruits of the Gamay vine, gleefully smuggling it back by the cubitainer over unmanned borders deep in the Jura. In due course our two children, together with joyous bands of university friends, signed up for the harvest and spent back-breaking days bent over the punishingly low Gamay vines (and headbreaking nights fuelled by rivers of Beaujolais). Then came Beaujolais Nouveau. People couldn’t get enough of this briefly macerated, cherry-red beverage whose production more than doubled between 1977 and 1985. But vast volumes and unseemly haste are seldom synonymous with quality, and while Nouveau proved to be a great cash cow for many hard-pressed producers, it did untold damage to the region’s image as a whole. Now, slowly, steadily, discerning wine drinkers are (re)discovering Beaujolais. Top Burgundy growers are looking south and snapping up the best vineyards. Côte d’Or producer Vincent Girardin recently purchased 20ha(hectares) of vines in the La Tour du Bief vineyard (Louis Jadot bought the other half), where he intends to make a quality red at an accessible price, aged in barriques from his Meursault domaine – ‘a Moulin-à-Vent in the style of a Burgundy’. The fabulous 2009 vintage was the cherry on the cake, with the promising 2010 hot on its heels. There’s never been a better time to visit this compellingly beautiful, compact little stretch of country between Lyon and Mâcon. You could do Beaujolais in a day – but don’t. Linger; take time to explore the area in all its variety, combining the newly created Route des Vins du Beaujolais with as many minor roads as you can muster (green-edged on any Michelin map, indicating scenic value). In the southernmost Pierres Dorées country close to Lyon (think the Cotswolds but warmer and sunnier, with rolling vineyards thrown in) you’ll find radiant golden stone villages, Romanesque churches and Renaissance châteaux (one of which, Bagnols, is a luxury hotel). 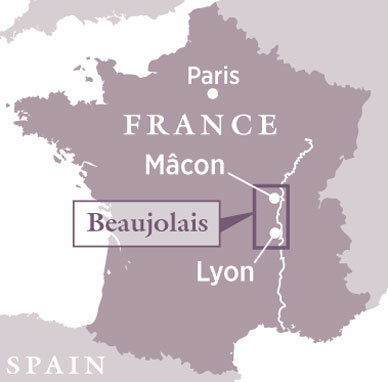 This is the heart of the basic Beaujolais appellation, responsible for oceans of light, bright, cheery Beaujolais (including Nouveau), with a handful of wine growers standing out from the crowd. Further north, with a sidestep to take in the 10th-century Cluniac cloister at Salles-Arbuissonas, you hit the first of the 10 crus (the named vineyards of Beaujolais) – Brouilly – and its Côte, set at a rakish angle like a big beret on top of the Brouilly hill. From here northwards, Beaujolais- Villages country begins to balloon out. A feature here are the elegant 17th- and 18th-century châteaux (de la Chaize, de la Salle, du Basty), many still working vineyards in family ownership where you can visit, taste and stay overnight. These were followed in the 19th century by a slew of fine vineyard manor houses, set proudly amid their rolling vines rather than tucked away in villages behind high walls. Once the property of the Lyon bourgeoisie, many are now in the hands of a new generation of wine grower-investors with a firm belief in the potential of Beaujolais. The villages that share the world-famous names of the most northerly crus (Morgon, Chiroubles, Fleurie, Moulin-à-Vent, Chénas, Juliénas and St-Amour) are surprisingly lacklustre, with none of the charm (or churches, or châteaux) of the Pierres Dorées. Plan on a tasting or two here, then buy a selection of regional goat’s cheeses, cured meats and a bottle of Beaujolais rosé (Belleville and Beaujeu have good shops and markets) and head up into the hills to the west for a picnic in the little known Monts du Beaujolais. With luck you’ll be rewarded with astonishing views, first of waves of vines unfurling at your feet, followed by the Saone valley and, on exceptionally clear days, distant glimpses of the Alps. Sue Style is an author and freelance wine, food and travel writer.